Formulation: Rhythmitised dilutions of witch hazel, madonna lily and silver, along with precious rose, bryophyllum (kalanchoe), marsh mallow and sunflower support the skin’s essential night-time tasks of cleansing, balancing and renewal. Application: Skin cells are renewed every 28 days. 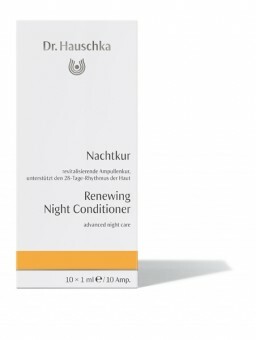 Mirroring this same regenerative cycle, Renewing Night Conditioner should be used for 28 days in place of a toner. Apply nightly, after evening cleansing. We recommend one 28-day cycle of Renewing Night Conditioner per year for each decade of life (for example 3 times a year at the age of 30). Twist off tab from the top of 1-2 ampoules and empty contents into cupped hand. Press gently and evenly to skin until the solution has been fully absorbed – include eyes, lips, earlobes, neck and décolleté. Ingredients INCI: Water/Aqua, Rosa Damascena Flower Oil, Althaea Officinalis Leaf Extract¹, Aloe Barbadensis Leaf Extract¹, Kalanchoe Daigremontiana Extract¹, Anthyllis Vulneraria Extract¹, Helianthus Annuus (Sunflower) Extract¹, Lilium Candidum Bulb Extract¹, Rosa Damascena Extract¹, Hamamelis Virginiana (Witch Hazel) Extract¹, Mica¹, Royal Jelly¹, Honey/Mel¹, Silver¹, Sodium Chloride.